Soil heating cables are to heating what soaker hoses are to irrigation - a long, flexible, infinitely re-arrangeable ribbon of warmth that puts heat right where you need it: in and near the root zone of your plants. These little devices have revolutionized the options for in-ground germination of early-season plants. Soil heating cables consist of either round or flat, heavy gauge electrical wire, wrapped in several layers of waterproof insulation. This allows the cable to be buried in soil and exposed to at least some moisture, sticks, rocks and other debris, without shorting and/or causing a shock. One end will have a standard electrical plug on it, suitable to plug into an extension cord or outside outlet. Cables come in various lengths, from only a few feet long to hundreds of feet long. Most cables are rated to provide heat at a 4:1 ratio. For instance, if you have 10 square feet of planting area to heat, you would need 40 linear feet of heating cable to do it. A few heavy duty cables reduce that ratio down to 3:1, such that 10 square feet of soil area would need only 30 linear feet of cable. Cables with automatic thermostats are typically set in the low 70’s Fahrenheit range, such that they come on when the soil temps drop below that temperature, and click off when soils warm up to that temperature. Cables without automatic thermostats can be plugged into separate thermostat controllers which offer a greater range of set temperatures. As the name implies, soil heating cables are one option for gardeners and farmers to warm the soil beyond ambient temperatures, and thus speed either germination and/or growing rates. That increase can be dramatic, cutting germination times down dramatically, and getting plants off to a very rapid start even during cool, wet early spring conditions. The soil cables can also help warm up planting beds which would otherwise be too cold to plant into even relatively late in the spring. Cables can be used in row crop areas, raised beds or wide beds. They can convert cold frames into hot frames. They can be used in otherwise unheated hoophouses and greenhouses, either in the soil or on/underneath the benches. Soil heating cables have a number of advantages over other forms of root zone heat. First, they can be used in confined spaces like hot frames and germination cabinets without concern of overheating the space, since the thermostat will turn the cable off once that target temperature is reached. Second, they can put heat exactly where it’s needed, including oddball shapes and around corners. Third, they are a much more efficient use of electrical heat for horticultural purposes than space heaters and blowers. This is an important distinction. Germination is definitely dependent upon temperature; the colder the temp, the slower the germination. Even after germination, temperature is one of the variables which controls plant growth rates. When plants are living in cool conditions, they grow more slowly and depending on the plant, may be stressed by those cooler temps. So raising the growing temperature is definitely desirable. However, we can either heat their aerial portions (ie, their leaves and stems) or we can heat their root zone in soil. Soil is a much better conductor than air, so it takes less energy (ie, less effort) to heat up that root zone than it would be to heat the air to the same temperature. In other words, if we’re trying to raise the temperature of the plant, the most efficient and cost effective way to do so is to heat the root zone. And soil heating cables are very good at doing so. Another advantage is that soil heating cables are a fairly durable source of heat, lasting for a number of years. And thanks to the cables being buried, they are actually exposed to less wear and tear than other heating systems which are above ground and thus exposed. They can be left in place for the season (or if used with transplants, pulled up and put down indefinitely), then stored over the winter and serve again that following year. They take up little space when coiled up, and require minimal maintenance other than keeping them clean and checking their insulation coat between uses. And finally, soil cables are hard to beat in terms of convenience. Lay it down in whatever configuration works for your planting area, bury under a few inches of soil, plug in, then you’re done. It would be a good idea to keep a soil thermometer going while the heating cables are in use, so that you’d know if they accidentally got disconnected or somehow stopped working. But that’s less effort than a lot of other heat sources. As appealing as soil heating cables are, they have some strong disadvantages. First and foremost, they can cost a pretty penny. As I write this webpage, new cables cost from $0.80 to $2.50 per linear foot. Combine that with the need for 4 linear feet of cable per square foot of heated garden soil, that cost gets uncomfortable really quickly. But that’s not the end of the cost. Electricity costs are a concern for many, and those costs are climbing quickly in some areas. Soil heating cables definitely use the juice. The colder the soil, the more electricity is required to bring it up to temperature. Secondly, the very nature of soil as a conductor of heat will ensure that some (probably most) of the heat you’re paying for will be conducted away from your root zone and into soils not currently used by the roots. If your heating cables are in use on or under a greenhouse bench, that loss might be minimal because the soils are contained. However, out in the field, the vast majority of the heat you’re paying for will radiate away from your planting bed, beyond reach of your plants. That heat is lost forever, and you’ll need to keep pumping heat into the soil to maintain those higher soil temperatures. When soils are heating via passive means such as collected solar energy or composting, with much lower acquisition and working costs, that heat loss isn’t quite so painful. But when you get that electric bill in May, after keeping your soils warm and toasty in March and April, you may decide to start growing plants that do well in much cooler soils. 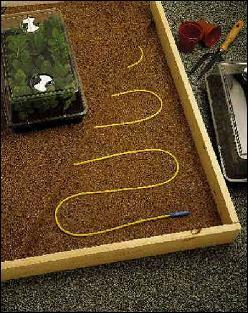 The other strong disadvantage to soil heating cables is the risk of damage from chewing vermin, such as rats and mice. For some reason, rodents love to chew on electrical lines, and heating cables are no exception. These rodents can chew on the heating cable at any point - where they enter the soil, where they lay beneath the soil layer, and when they are in storage between uses. If rodents chew through the cable, the cable is worthless. If they chew through your cable five days after you lay it down, you’re out of luck. If you are lucky enough (!) to have rodents chew through it in that short interval between laying the line and planting, then you can still unearth the line and replace it. But to my knowledge, the lines cannot be patched or spliced and used again. Rodent pressures out in the field can vary tremendously, from farm to farm, field to field, year to year. You may not have much rodent pressure, and this disadvantage would be a minimal risk. But enough growers have reported rodent damage to power lines of any kind, that it should at least be considered. A third disadvantage is that the heating cable is buried for field use. Out of sight, out of mind. More than one grower has laid the cable down in springtime, the plants grew, were harvested and then pulled out. Then the grower went back to that planting area with their cultivation tools at some point in fall, or even early that next year, only to remember too late that the cable was still laying there. Whether the cable is cut by shovel blade, rototiller tines, harrow disks or by rodent incisors, it’s still useless once cut. If you ever want to hear the full extent of a grower’s expletive vocabulary, time your visit to coincide with the day they start working that bed, and start pulling up small short sections of heating cable that they forgot were there. They’ll say every word in the book of bad words, more than once. Weed cultivation is a related issue. Your bed needs to be VERY clean because your weeding options decrease dramatically when you’ve got soil heating cable buried out there. Unless you were very diligent in marking where it was, it’ll be hard to hoe, stir, till or otherwise disturb the soil without hitting sections of that cable. If you do only nick the cable, you’ll either have to stop using it so that it won’t continually short out through that hole in the insulation, or worse, dig up that area enough to wrap it with electrical tape. The alternative is, of course, to pull weeds by hand, which may or may not be practical depending on your growing area, schedule and other manpower duties. Even transplanting into a freshly built bed can be a risk if dibblers, bulb corers or other digging tools are used to form the soil holes. Those can nick or cut through the insulation too. Whatever the case, it might be worthwhile to put a very big BURIED CABLE sign in that planting bed so that hopefully no one stirs the soil for any reason while the cable is still there. Soil heating cables can be used in two basic ways. First, they can be put right into the soil in either a planting bed, or a hot frame. The cable can be arranged in a wide variety of patterns to fit the area it’s covering. But no two sections should be closer than a few inches, or farther away than 6”-8” depending on the cable. Cable sections should never be allowed to touch each other because the heat buildup can start to melt the insulation covering the wire. Spacing the cable sections farther than 8” away from each other would leave cold spots in the soil. Once the soil heating cable is laid, it should be covered with several inches of soil such that the cable is no longer visible. Then the bed can be either direct seeded or transplanted. If direct seeding, be careful that any seeding trenches are shallow enough that they don’t disturb the cable underneath. If transplanting, make sure to either avoid sharp-edged coring tools, or mark where the soil cable is so you don’t nick it or cut it outright. Once the bed is planted, the cable can be plugged in and if necessary, the thermostat set for the desired temperature. Some cables have a built-in thermostat featuring just one temperature, typically in the low 70’s Fahrenheit. Other cables are designed to be used with a separate thermostat, which will often have a soil probe which should be inserted immediately near one of the sections of cable. Once that thermostat is set up, if needed, the cable can be plugged in and powered up. Very little is left to be done through the growing season, other than sampling the soil temperatures occasionally with a separate thermometer to make sure the soil temps are in the desired range. And that’s it. At the end of the season, it’s best to pick up the cable, clean it of any mud, clay or other debris, and coil it up to be stored safely out of harm’s reach. We have not used soil heating cable, for two reasons. First, we have a fairly high rodent incidence here, and I really really don’t want to go outside to find my cable chewed through. Secondly, we have access to other, cheaper, heating options. But while researching this webpage, I did come across the account of a market gardener who used heating cable to germinate and stimulate growth of carrots, beets and other root crops in January. Of course that’s not an ideal time to use cable, because the soil temps are the coldest at that point and therefore cable use would be at its most expensive point. But this particular grower needed those crops, so that’s what she used. She was generally happy with the results despite the high costs. Her blog entry is available here. Soil heating cables can provide quick, easy, reliable heat, as long as you respect their cost and their vulnerabilities. If that cost is worthwhile and those vulnerabilities are minimized or protected, soil heating cables are tough to beat. Many of the PDF bulletins we have provided on the cold frames and hot frames pages include information about soil heating cables. This is because soil heating cables are often paired up with cold frames, to convert them into hot frames. We offer those PDFs again below. The University of Kentucky has published a very helpful bulletin called Hotbeds for Transplant Production, which has an extensive section on heating cable selection, installation and use. Soil heating cables are available in a wide variety of home improvement centers, gardening and farming supply houses, and via online retailers. Please see the right column of this page for a variety of soil heating cables from reputable manufacturers such as FarmTek and GrowQuik, available through Amazon.com. Sometimes used cables are also available via online trade hubs such as Ebay and craigslist, but their availability is spotty at best. And caveat emptor - Buyer Beware. There’s no way to know in advance if the used equipment you’re buying might have been damaged in some way. An alternate possibility is to put out an ad in a regional grower’s newsletter or email list, saying you’re interested in buying heating cable. Anyone with cable they’re not using anymore would probably be delighted to sell it at a discount, and you’d at least have the chance to inspect it and even test it first. Given that one of the major drawbacks to heating cable is the purchase price, buying sound cable at used prices might work out well for buyer and seller.